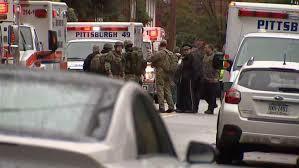 Several killed in US shooting near Pittsburgh synagogue – Royal Times of Nigeria. A gunman opened fire at a synagogue in the US city of Pittsburgh today, reportedly killing at least four people and injuring an unknown number before he was taken into custody. The local CBS affiliate reported that eight people were confirmed dead, while Fox put the death toll at four. A police spokesman addressing reporters at the scene confirmed “multiple casualties” and said, three officers, were shot before the shooter was taken into custody. The condition of the officers was not immediately clear. Police were still clearing the building, the official said. Pittsburgh’s Public Safety department, which includes the police, earlier tweeted that an active shooter was in the area near the synagogue, urging residents to stay away. The Tree of Life congregation is located in the area cited by police, and the incident occurred on the Jewish Sabbath. US President Donald Trump tweeted that people “in Squirrel Hill area should remain sheltered. This is the latest shooting incident in the United States, where gunmen regularly cause mass casualties and firearms are linked to more than 30,000 deaths annually.